This is the month you may begin to renovate or add value to your home by modernising. Moves that happen now will go smoothly and will signify a new start for you. Home moves that happen now will be for the purpose of greater security, greater convenience and comfort, i.e., you may move somewhere where there is less traffic or less noise and more privacy, or you may build walls or plant trees to make your home more pleasant. It is also a time when there are many family activities, and the focus may be on important events to do with family members, i.e., weddings, retirement parties, christenings, etc. The home is an important centre of activity, and you will also take on a mothering role (regardless of whether you are female of not) to extended family members. You may cater for family events or offer up spare rooms or sofas for visiting family members. You are a person who is in demand right now; if you are older, you will be the matriarch of the family; if you are younger, you may be called upon to act like an older sister to siblings or cousins. Emotional needs are stronger and more urgent; it will become apparent who supports you and nurtures you and who is just a drain – you will be generous with your affection and your time, but after this month you will have a much clearer idea about who deserves your care and who abuses it. This is a strong month for parental instincts, and if you do not have children, you will be broody. You may suffer from empty nest syndrome, but this may be the impetus to be more involved with nieces and nephews. You will tend to be more worried and protective over your children, and this could signify a time when your children are growing up and becoming less dependent, and this can cause an identity crisis where you feel less needed. Many may decide to return to work as the children are now at school. It is hard to see things in perspective this month, but things are actually better than you think. You have a quiet confidence and optimism right now, and while at times you may question that confidence in light of logic or developments, you just cannot shift the feeling that things are indeed working out for good. This month can often see Scorpio returning to a strong faith based approach to life – it is a satisfying month for those who are religious or who have an open-minded attitude to life and the universe. You can see your life is part of a divine plan, and it feels good. A very good month for Valentine’s Day and love. You should plan your Valentine’s Day ahead of time, as when it comes you may feel a little lazy, and it would be a lost opportunity to do something special and memorable. Ideal plans are weekends away, somewhere secluded rather than a hectic trip like going to Vegas. 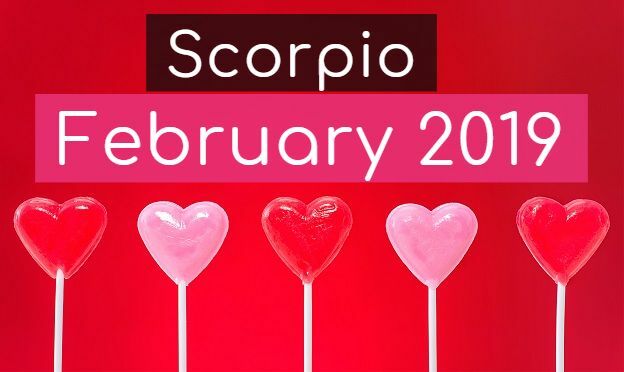 Single Scorpio should accept invitations to Valentine’s Day parties or events as this is a good month to meet like-minded people with whom you can have a meaningful connection. This is a very good time to make a good impression. Your romantic instincts are good now, and you will sense subtle nuances allowing you to make the right move. In long-term relationships, you should not take things for granted just because you are both relaxed and easygoing – use this time to make plans for the year ahead and also to make romance orientated plans. Relationships can go into decline when you stop doing fun things together, and so what better month to think about the things you used to enjoy together and reintroduce them. In general, all relationships are warm and friendly, and this can be the start of a new chapter if things have been strained. The only negative is that you may not make the most of the opportunities for starting new relationships or improving existing ones; you may just think it is a good time for a breather rather than reform. Scorpio need to be more cognisant of toying with the feelings of others – make sure they know where they stand regarding where you see it going. Relationships that begin now may remain in the friendship phase for a longer period than the other person is expecting. Often, career goals have to be subordinated to your family concerns, and you may even take time off work to move or devote time to family. February is a very good month for starting a business in real estate, interior design or catering. It is very favourable for family businesses, especially those that are connected to construction or hospitality. Work-life balance and priority considerations are vital this month. This could be the month where you change to a more flexible type of employment which can give you more freedom to pursue important family goals without neglecting those you love for the sake of work. Family events may force your hand regarding what your priorities are. In some cases, the opposite is true where you are now able to devote more time to work goals due to family commitments lessening. This is a month of careful consideration rather than a surge forward – you will take time to review the options and delay decisions until it feels right. Many things which happen now are directly related to past events – this can serve as a guide. The past is not always a good predictor of the future, but this month, the past is a very reliable barometer – if someone let you down or was a bad partner before, then write them off, no second chances as they are unlikely to be any better the second time around. This is a very good month for settling legal matters, foreign investments, and international trade. Small scale work related to social events can help foster camaraderie and team building.